Beer growlers have come a long way. From humble beginnings, beer growlers began as little more than a bucket with a tight-fitting lid. With advances in technology, these growlers have changed. Now they are sleek canisters with amazing insulating properties, come in a multitude of colors and finishes, and offer a variety of lid option designed to meet your specific needs. These are more than just steel bottles. The best outdoor beer growler to be designed to maintain temperature, preserve carbonation, and be rugged enough to be transported. These requirements make them a perfect receptacle for any liquid, from water to soda. And their stainless steel, BPA-free construction make them a safer alternative to plastic bottles. 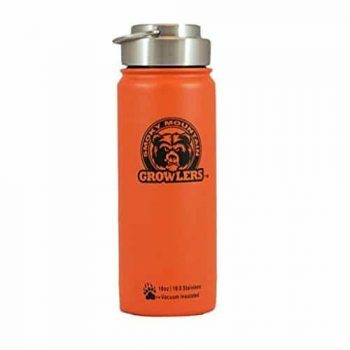 Whether you plan on taking your growler to the pub to be filled with craft beer or just need a bottle to keep water cool throughout your shift at work, this list has an option for you. Not all growlers are created equally. Here are a few of the features to be aware of when researching your purchase of a quality insulated beer growler. Traditionally, growlers have been made from metal, glass, or ceramics. Each material has its strengths and weaknesses. Obviously, glass and ceramic growlers will be more fragile than those constructed from metal. They most likely will be less insulating as well, depending on the construction. Metal is the material of choice in the growler universe. Stainless steel to be exact. Stainless steel comes in several grades so look for the highest quality in your budget. The most common grade is 304, also called 18/8 (18% chromium, 8% nickel). The high corrosion resistance and low carbon content of 18/8 make it ideal for food preparation surfaces, medical equipment, and beer growlers. Insulation is a key feature of vessels designed to carry beverages. Insulation is achieved in growlers one of two ways, either by trapping air in between layers of stainless steel or by relying on the insulation properties of the material itself, like in ceramic containers. Look for double walled stainless steel. The space between the two walls serves as an excellent insulator, ideal for this application. Growlers with vacuum seal construction will perform even better as the air between the walls was removed during the manufacturing process. Growlers are meant to carry a lot of beer. The most standard capacity is sixty-four fluid ounces or 1.9 liters. That is a lot of fluid. And a lot of weight. Several manufacturers offer smaller sizes such as 40-ounce and 24-ounce options. These bottles will be lighter and more portable, fitting more easily in cup holders and the refrigerator. Growlers are available in many different sizes and shapes. Some are wide at the bottom and taper to a narrow mouth while other are shaped more like a fat cylinder, ending in a wide mouth. Some are even tapered at the bottom to accommodate cup holders. Of course, this makes them extremely top heavy. It is important to select a shape that will be practical for you to use. It would be a shame if that brand-new growler were an inch too tall, preventing your cooler from closing. All growlers have lids, but not all lids are created equally. Some are made of cheap plastic, which will warp the first time someone accidentally runs them through the dishwasher. Some have metal lids, but if the lid is not insulated heat and cold will escape. Plastic lids create a great seal when tightened and metal lids will leak if no O-ring or gasket is present. Lids offer several features. Some have pop-ups for drinking without opening the entire growler. Others have intricate closure systems, called bails, which snap down firmly once the lid is on to prevent any liquid or CO2 from escaping. The most elaborate lid on our list pumps CO2 into the growler, preserving the beer for the most enjoyable drinking experience possible. 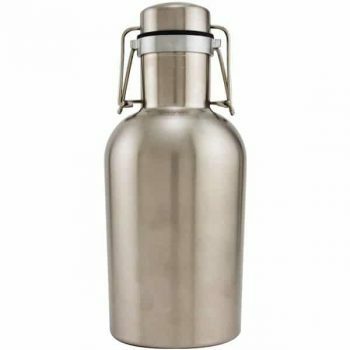 Growlers are offered in a variety of colors and finishes with the most common being brushed stainless steel. Several manufacturers offer powder coating or baked-on finishes in both rough and smooth textures. If you are looking for a certain color, ensure the finish is of high quality, designed to withstand scratches and chips. Otherwise just opt for the basic stainless, it will last a lifetime with little signs of wear and tear. The quality of the growler can often be gauged by the rim construction. Better growlers are designed with your mouth in mind. The lip of the opening is rolled or softened. Cheaper growlers have sharp lips making for unpleasant drinking. The shape of the lips, or openings, varies also. Many growlers are made with a wide mouth to facilitate filling and pouring into glasses. Of course, this can make drinking directly from the bottle a bit cumbersome. Narrow mouths are easier to drink from but filling the growler may require a funnel. What is preferable depends on how you are planning on using the growler. Growlers are large and carrying one for long distances can be cumbersome. Some manufacturers include a sleeve which fits around the container and is attached to a sling to be worn over the shoulder. Others have handles built into the design. If you have small hands, the handle might be an important option to consider. Sleeves made of neoprene offer yet another layer of insulation and might elevate an average performing bottle to excellent status. Recent research suggests that BPA or Bisphenol A is unhealthy if ingested. Plastic containers or bottle sleeves containing BPA are known contaminants of food and beverages. The best manufacturers stay away from BPAs and label their products as BPA-free. These are the features to consider when researching the purchase of a beer thermos. If you do your homework, you should be able to find the perfect fit for your needs and budget. Cared for properly, a beer growler will last many years, so spending some time finding the perfect match is well worth it. Using these same features as a guide, we have selected a list of the best beer growlers available. This group reflects the best quality and value on the market while offering a variety of styles and colors to suit anyone’s taste. Whether you are a home brewer, a craft beer connoisseur or just looking for a way to carry your daily dose of water, you will find what you need below. 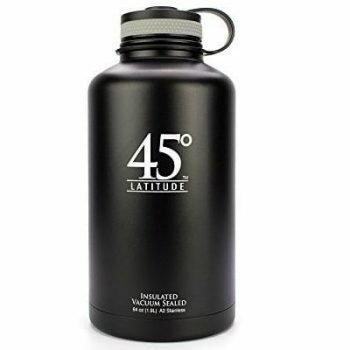 The 45 Degree Latitude Beer Growler is an impressive drink container for the price. This growler includes many of the same features as the high-end entries on our list but at half the price. Double-walled vacuum insulation allows the company to claim this bottle keeps cold beverages cold for up to 24 hours and hot beverages stay warm for 12. The lid is plastic and threaded so durability may be a factor but several reviewers have noted that aftermarket lids will fit this growler in case replacement is necessary. One feature that makes this growler stand out from the crowd is the inclusion of 6 colored bands. The idea is to identify each container, so everyone keeps track of their beer. Not a bad idea. Overall, this is a solid option for the price with good reviews and a nice design. The Kegworks Stainless Steel Beer Growler is a simple, no frills entry on our list. With a clean design and a nice stainless finish, this is an attractive choice. I especially like the single bail metal lid. Bail-style lids are known for creating a tighter seal than threaded lids which ensures your beer will have some fizz left when you finally crack this growler open. On the down-side, Kegworks opted for single wall construction which will impact the insulating ability of the bottle. Also, without the added layer, condensation will most likely form when cold beverages are inside, causing the unpleasant sweating for which cheaper bottles are known. Due to its construction, I cannot recommend this bottle for keeping hot liquids, the lack of insulation just won’t support it. Best Use: Keeping beverages cold or hot, maintaining carbonation, keeping beer fresh. Hydro Flask is a giant in the steel bottle industry, so expectations were high when they entered the beer growler market. They did not disappoint. Hydro Flask Insulated Beer Growler leans heavily on the advanced technology of Hydro Flask. The patented Temp-Shield insulation caused several reviewers to claim ice stayed frozen in their growler for 72 hours. 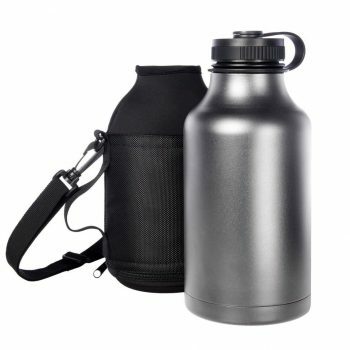 The wide mouth is capped with a threaded lid and sports a beefy carrying loop, although the weight of 64 ounces of beer might be a stiff test for the design. The growler is available in 10 different powder coated colors with a slightly rough texture for better grip. All in all, this is a great growler. 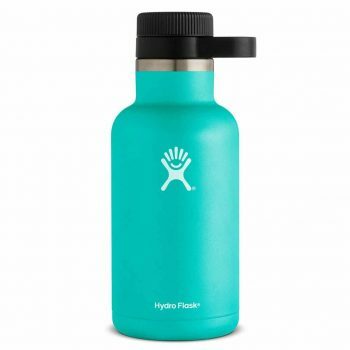 Unfortunately, the supporting line of caps that is available for Hydro Flask’s other bottles will not fit the growler. This is disappointing as one of the best things about this manufacturer is the ability to mix and match accessories to customize your bottle. Still, if you are not worried about budget, this is a quality product, and it will meet all of your growler needs. I love products with a story, and MiiR has a good one. This company donates 5% of revenues to clean water projects in underdeveloped countries. With each growler, you receive the GPS coordinates for the location your 5% will be used. That is pretty cool. 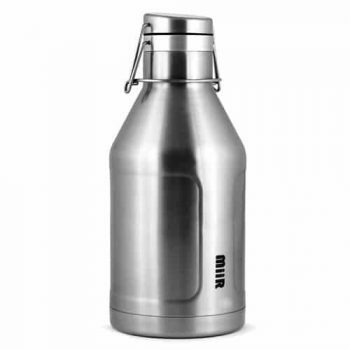 MiiR Stainless Steel Beer Growler itself is a quality product boasting double-walled insulation and made of quality stainless steel. Miir utilizes a single bail closure system with a metal cap. No carbonation is escaping from this growler. The finish is brushed stainless steel and indentations were added to help with grip. The Ivation Insulated Beer Growler comes in near the bottom of this list’s price range, but it doesn’t lack for features. Just like the more expensive options, Ivation went with stainless steel double-walled construction, ensuring solid insulation and no sweating. This growler has a plastic, threaded sports cap, allowing you to drink without removing the entire lid. That is a convenient feature. Included is a neoprene sleeve with a sling, perfect for hiking or walking in the park. If I needed to purchase more than one bottle, say for the kids, this would be my choice. It is a perfect bottle to carry and chill almost two liters of water, and the sports cap makes it easy to drink. Plus, the price is right. DrinkTanks makes a serious growler. One that gives the impression that this is the option real beer people would choose. First, the design makes it look like a tankard. It has an oversized full-length handle, a tapered neck leading to a wide mouth, and a dual bail closure system the manufacturer says will hold pressure at 60 PSI. Your beer will stay fresh in this growler. The DrinkTanks Classic Beer Growler comes in 14 different colors. Of course, the construction is double walled vacuum sealed food grade stainless steel, as you would expect. This is a great growler, but the design might be limiting. 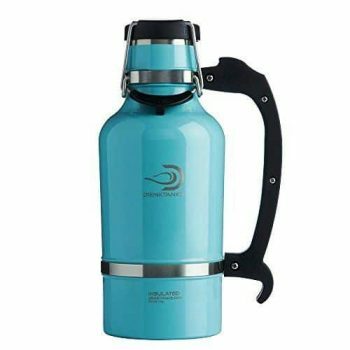 With the stein-style handle, this is a big and bulky container, not something you would throw in a pack and take hiking. But if you are serious about your beer and want a growler for that reason, this is the obvious choice. Features: BPA-Free, 304 Stainless Steel Construction, Black Rubberized Exterior, Double-Walled Insulation. Best Use: Keeping Beverages Cold or Hot, Maintaining Carbonation. The Yukon is an interesting entry on the list. 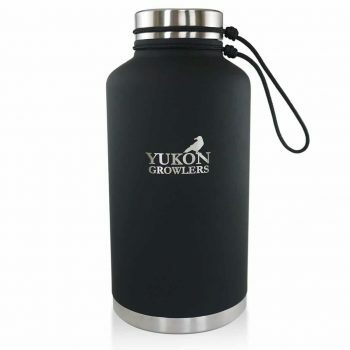 Yukon Growlers Vacuum Insulated Beer Growler has many features of the higher priced options. Double walled vacuum sealed insulation and 304 stainless steel construction. It sports a wide mouth and a threaded lid, but Yukon went with a double walled vacuum sealed stainless steel cap. That is smart. I also like the loop Yukon incorporated into the lid design. The cord is long enough to secure the lid when open without getting in the way and makes for a convenient carrying strap when closed. Plus, because it is tied on and not molded, if it breaks you can replace the loop instead of the entire lid. The feature of this growler I liked the best was the black rubberized exterior. Yes, it would be very easy to grip and comes in an attractive matte black, but I like that you can write on the growler with chalk. This would be especially useful if you were picking up several beers in multiple bottles. The Smoky Mountain All in One Growler is another well-constructed double-walled vacuum insulated bottle but with a twist. The folks at Smoky Mountain incorporate something they call Thermal Bear-ier Technology in their bottles and believe this puts them over the top. The technology consists of the traditional insulation mentioned already plus a double-walled lid with a double silicon sealing system designed to keep the cold and carbonation in. Several reviewers agree that this growler does its job well. I especially like the inclusion of a small metal handle built into the lid, much like the old lanterns used to have. This is a good solution for what ends up being a pretty heavy container when full. The Smoky Mountain comes in three colors and multiple sizes. All options include the Bear-ier technology. With so many great growlers on our list and so many different options, there truly is a beer growler for everyone. Whether you are a beer aficionado or just looking to carry more water to work, one of these options will be perfect for you. Do you own one of these bottles or have a favorite not included in the review? If you do, share your story with our readers and us in the comments section.